MD of GWR Roofing, Andrew Gove, values hard work and enjoys the fruits of his labour. Managing director at GWR Roofing. WHAT ARE YOUR RESPONSIBILITIES IN YOUR CURRENT POSITION? I am responsible for the daily operations of GWR Roofing. I have admin, sales and operational staff reporting to me. I monitor the cashflow, sales and production of our teams. WHAT DO YOU HOPE TO ACHIEVE IN YOUR CURRENT POSITION? WHAT HAVE YOU ACHIEVED SO FAR? I am continuously working toward creating a leading roofing company that generates employment in South Africa while producing quality work in the building and residential sectors. I have grown this organisation from a ‘one-man band’ to a company that employs 42 people. I hope to continue this trend and invest in South Africa and its people. Seeing the growth of my staff members is a great pleasure to me and I am very proud that I have team leaders who have grown both personally and professionally. It is my goal to see these team leaders move into a supervisory position or to even start companies of their own. I enjoy offering solutions and good service to my clients. WHAT ARE THE MAJOR CHALLENGES THAT THE INDUSTRY NEEDS TO OVERCOME? At GWR Roofing we install timber trusses, either prefabricated by a truss manufacturer or handmade according to an engineer’s detail. Unknowledgeable roofing inspectors / engineers signing off non-compliant roofs. 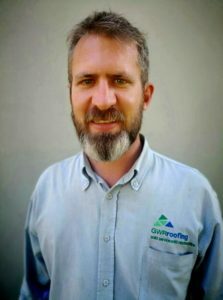 The Institute of Timber Construction South Africa (ITC-SA) trains competent roofing inspectors and they have been actively involved in educating the relevant stakeholders against the use of unknowledgeable and unregistered inspectors. WHY DO YOU USE TIMBER IN CONSTRUCTION? Timber is the traditional material for the construction of roof structures in South Africa. Our treated pine handles harsh weather conditions very well. Timber is also aesthetically pleasing. EXPLAIN HOW YOU GOT STARTED IN YOUR CAREER AND HOW DID YOU END UP WHERE YOU ARE TODAY? year working for a training company, writing training manuals for bankers. Fortunately, I was contacted by an ex-client of mine, who had the money to go ahead with a job that I had quoted on a year prior. I promptly organised the supply and installation of his roof which we completed without a hitch. With the proceeds of that first job I was able to pay a deposit on a vehicle. I left the training company and entered the construction industry. It was a difficult start; I had only three staff members, Ottoman Mkize, Simnikiwe Mdukiswa and Afikile Machifa. Over the years with a lot of hard work and with buy-in from my staff we have developed GWR Roofing from base level to an organisation with branding initiatives, offices, internship opportunities, vehicles, solid business process and 42 staff members. WHAT QUALIFICATIONS (AND FROM WHERE) DO YOU HAVE? I have a B-Com degree in Small Business Management and Entrepreneurship from UNISA. I am also a Certified ITC-SA Category A Roof Erector. It was a relatively easy market to enter and the experience that I have gained in roofing from my time at the truss plant supported my decision. I also had the support of the ITC-SA, Colin Armstrong and Dave Polmans, who assisted technically. The repairs market is generally quite stable. For the homeowner, house repairs are always a necessity. We have noted a slowdown in new builds, which is indicative of the general economy. We had a good year in 2017 with a fair balance of work between repairs and new builds. This year did not start off as positively as expected but the second half of the year seems very optimistic. DO YOU ENJOY WHAT YOU DO AND WHY? WHAT IS THE FAVOURITE PART OF YOUR JOB? I am passionate about roofing and GWR. I enjoy offering solutions and good service to my clients. I particularly enjoy seeing the change we create on site either by renewing a roof or installing one on a new build. I believe that the building starts to become a home after the roof has been installed! HOW DO YOU SEE YOUR FUTURE? WHAT DO YOU STILL WANT TO ACHIEVE? operate in. Presently when a roof is priced the first stop for builders and home owners are the truss plants, the erector is often secondary to this process. As the party who will be physically installing the roof, I believe that the erector should be the first point of contact for the clients. The erector should manage the entire installation process, from appointing a truss plant for the supply, to ensuring that the roof passes off the final A19 inspection. On a personal level I would like to complete the ITC-SA Inspectors course and further my studies in the fields of health and safety and project management. WHAT BIG PROJECTS HAVE YOU BEEN PART OF? Most of our residential jobs are exclusive houses in the major residential estates in KwaZulu-Natal. We have installed the roofs to several schools in the Eastern Cape.